11.Nov.2017 - Thanks to Marshall Eubanks for replying to my post. This is an Apollo asteroid and a NEO. The orbit uncertainty is very high (condition code 7). i.e. whether some clones might have arrived from the outskirt of the solar system - threshold: 100 AU. 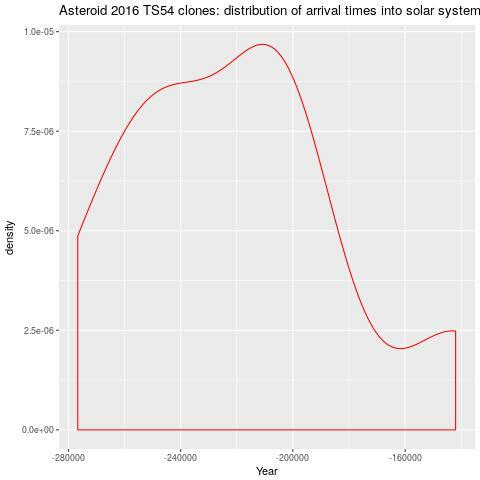 The cometary origin of Asteroid 2016 TS54 is less clear than in other cases where I got a lot of clones with cometary-like orbits. Anyway, in this case 9 out of 100 clones arrived in the solar system from a distance greater than 100 AU. I would not be surprised if many more clones would get ejected if the simulation went more back in the past. What is curious is that one clone (only one!) seems to have entered the solar system following an hyperbolic trajectory. I think this is just a simulation fluke due to the fact that clones "diverge" quite a lot and so some of them seem to have an hyperbolic trajectory. However, this raises a question: people who are really expert in this field may be able to put some constraint about the probability of these "unstable" asteroids (or old comets?) being hidden interstellar objects captured a long time ago. This possibility is related to the question "how rare is a close passage of an interstellar rock to our star?" discussed by Alan Harris in this MPML message. the "early warning" given by Bill Gray, probably the first public mention! A deep analysis from Bill Gray that summarizes why the object is with no doubt interstellar (in response to many questions, including mine, on whether there might be alternative explanations). look at MPML to see very interesting threads about this object.